Antilia is a phantom island in the middle of the Atlantic. It is more formally known as the "Ilha das Sete Cidades." Filled with riches, it too has been associated with the Azores Islands. The flowers here are meant to be hydrangea, the official flower of the Azores. Hydrangea are a symbol of mourning. The hint of blue will be carried throughout the graphic novel as a symbol of "saudade." Blue is also the primary colour of the Azorean flag, and the name "Azores" itself is a derivative of the portuguese word for blue. Once again, the music coming from the shepherd boy is Canada's national anthem. This is the legend of how the twin lakes in São Miguel got their colour. In the actual legend, the shepherd boy's eyes are blue while the princess' eyes are green. I switched the eye colour so that I could carry the blue into more pages, and the princess is in more pages than the shepherd. The houses in the background have a special guest if you zoom in closely. The writing is derived from Vavô's actual handwriting. The signature is actually his. The image was drawn from a photo taken before Cordelia was born. The "baby" in the photo is actually a teddy bear. Once again, the flowers in the street are hydrangeas. I've included some of the characters who will show up later in the graphic novel in the parade. This is a representation of the parade of Santa Maria (Holy Mary, Mother of God). Masa is a sweet bread often made at Easter. The rising of the dough symbolizes Christ rising from the dead as in the Passion story. ​The church is the central hub of Água de Pau, Nossa Senhora dos Anjos. The dancers are dancing a traditional folk dance called the Chamarrita. It is a "call" dance where a caller announces the dance moves and the dancers dance in circles. In the background is a cameo by my first concept art of Vavô in the present day. The photo in the background is of the newly landed immigrants from when Vavo arrived in Canada. The guitar is a Portuguese guitar consisting of twleve strings. The technique used to play this instrument is called "dedilho," which translates to "fingernail" in English. The third panel is also a reference here to the lovers at Sete Cidades. 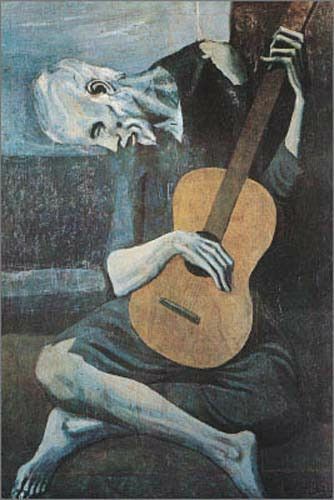 The image of "A Severa" here is a tribute to one of my favourite paintings, Picasso's "The Guitarist" painted during his Blue Period. A Severa's mother, was called A Barbuda, "The Beareded Woman." She ran the brothel where her daughter "A Severa," (real name Maria Severa Onofriana), worked. The street is actually from Agua de Pau, my grandfather's hometown. The image of the Count mourning his loss is meant to mirror the King of Sete Cidades' loss of the queen. ​I wanted to show in the bottom panel how these stories of "saudade" are repeated through history, with slight variations. ​The shore in the background, once again, is Caloura. This song is a traditional "Fado" song that has been sung for years in the Portuguese culture. Click here to hear "Primavera" as performed by Portuguese Fadoist Mariza. The streets in the background are from Agua de Pau. The number on Vava's house was her actual house number. The church, once again, is ​Nossa Senhora dos Anjos. This is an image I later drew from reference with a photo taken of Nossa Senhora dos Anjos on our tour of Agua de Pau. Something that Vavô did not tell me was that his mother passed away when he was only 19 years old. When he left, then, he only had to say goodbye to his father and his sisters. This is Vavô's actual passport. He kept it for posterity, as well as every other passport since. This fascinating story of how the Azores was formed comes from The Islands of Magic: Legends, Folk, and Fairy Tales from the Azores. While working on this graphic novel, I became fascinated with how the Azores Islands got their name. Santa Maria, for example, was named when Portuguese explorer Gabriel Gonzalo Vehlo was searching for new lands, was stranded for days at sea, and instructed his crew to pray for guidance. While praying to the Virgin Mary, they found what would later be called Santa Maria. Other islands were named on simpler terms: Texeira (Third) for being the third island discovered, Pico (Small) for being the smallest. Vavô had an amazing memory, and he could tell me down to the actual date when things happened. For some reason, though, when asked him to recall conversations with Vava, he dodged the subject. Maybe it was too painful. So all of these encounters are real experiences with imagined dialogue. In my original version of this page, I had Vavô saying goodbye to both of his parents. I would later find out that Vavô hadn't told me his mother died when he was 19 years old. When Vavô says here that he is following the sun, it's because the sun sets in the west, so he was literally chasing the sun as it went down. I love this part of the story. It illustrates just how poor he and the rest of the immigrants travelling with him were. The only way they could afford to come to Canada was travel in a plane used as a cargo plane. When Vavô told me this story, I knew I had to include it. It serves as a nice counterpoint to his loyalty and fidelity. Many men who came to Canada simply left their pasts behind them. Vavô chose, instead, to remain faithful to his wife of five days. This speaks volumes about his integrity and his character. The second panel here illustrates just how lonely it was to be an immigrant in Canada. I was going to parallel this story with Christmas during the Battle of Ortona (where a group of Canadian soldiers took on the Germans in a small Italian town). 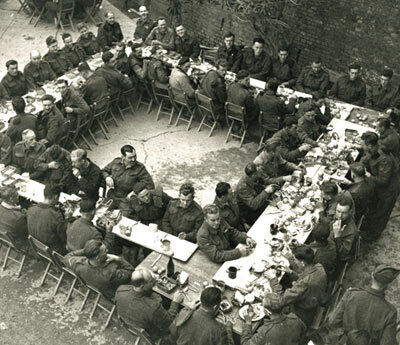 On Christmas Eve, the Canadians shared a family-style meal in a bombed-out church. In the background of the first illustration on this page is a bookshelf (click here to learn more) containing references to texts I used in preparing this work. In this page, I only touch upon the many things my grandfather did for other Portuguese families. He would often help translate when families were buying homes and lent money in some cases as well. The bottom panel contains several references: the teacher here is Mark Rowe, who taught at St. Francis when Vavô was there. I would later teacher with Mark at another school. The names of the students here are all of my friends. The only one missing is José; I didn't want it to be confusing as this is Vavô's name. This is my interpretation of Plato's description of Atlantis, with a few embellishments. I wanted it to be enormous in scale. The idea of Atlantis consisting of concentric rings was interesting to me, so I kept the idea, but included massive Doric columns to give the impression both of wealth and strength. The Cathedral in the background here is dedicated to St. Brendan himself and is located in Clonfert, St. Brendan's home. One of my favourite images here is of Vavô and our tour guide at Furnas. It was amazing to see him tell his stories to a new audience, who was just as captivated as we were. The top image here is one that my family knows all too well. In Vavô's last days, he had numerous sores in his throat, preventing him from being able to drink without choking. As a result, he kept begging for water, and it was heartbreaking not to be able to give it to him. So seeing him at the fountain in Água de Pau (which is also coincidentally means "Water from Wood") is how we imagine him in heaven. The house in the top panel is actually Vavô's home from when he was a child. The image in the top right is of Vavô and his great grandson, Kaiden. The image after that is Vavô and Cordelia, followed by Suzie and Cordelia, and finally Cordelia and Katelyn.